Welcome to hell on earth, this game present the revelation of zombie attack and it can be easily included in car games and shooting games category. You're the only soldier that have left unhurt by zombie so as result you have to save all your comrades and escape from this grim island. 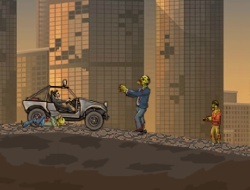 You've got a car and you have to cross over zombie's path and reach the finish line where your colleagues wait for you to come and rescue them. You won't do that if you don't improve your skills and abilities and not just that, every course you make will bring you money that you must spent on upgrading your car. After you play a while and pass some levels you'll see that others cars that was locked for you are now ready to be bought. Use your perseverance and you patience to achieve the maximum score and to save your soldiers. Take it like it's a real mission of rescue and the adrenaline will surround you while you play this awesome game. Use arrows to play this game, up for accelerate, and left and right to move. Earn to Die 2 Exodus 0.00 between 0 and 10 based on 0 votes.